To our new visitors, welcome! I’m so glad you’re here! Wow, I’m so happy so many people have been interested in the Healthy Unicorn Smoothie Recipe I shared a couple days ago. I stayed up till almost 2am working on that one, but it was definitely worth it. The recipe was shared by Food Babe (on Facebook) and Buzzfeed. Whoa! And thank you to everyone else who shared it too. Since I have so many ingredients to make more unicorn recipes, I figured why not experiment a bit with them? I have a couple ideas for future unicorn recipes and two already complete. It’s been an exciting Saturday. Today I’m sharing this pitaya-bowl-style Healthy Unicorn Smoothie Bowl Recipe. 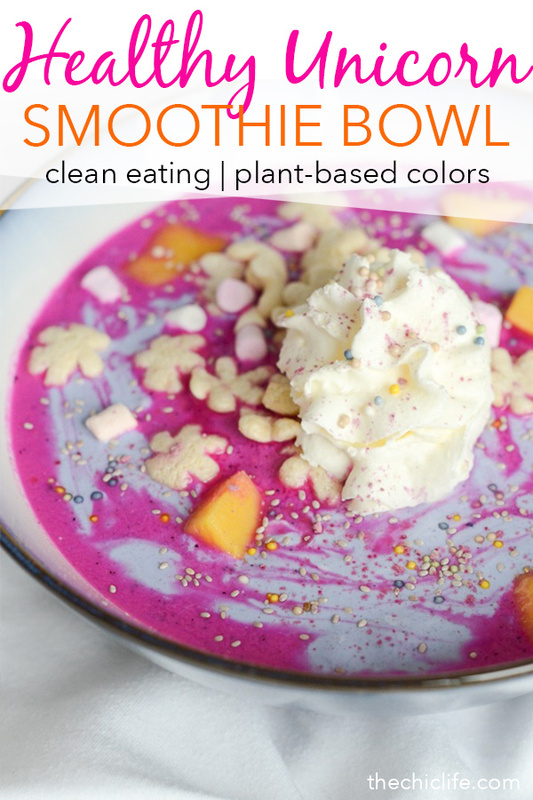 And like the smoothie, the colors in this bowl are made from plants, not chemicals! I’ve been wanting to share a pitaya bowl recipe with you guys, so here we go. 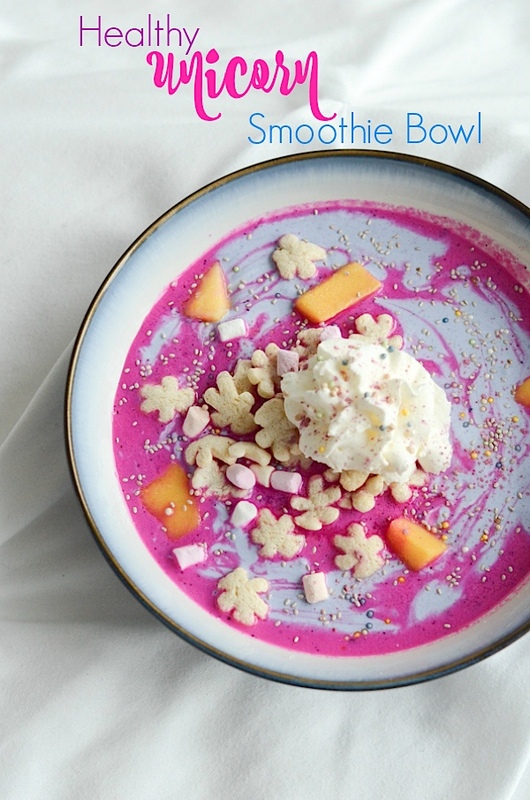 Today we do this Healthy Unicorn Smoothie Bowl Recipe. I have a basic one to share another day. This is similar to the other smoothie recipe, except this has a different flavor profile. And this one is poured into a bowl. And you get to add more toppings! 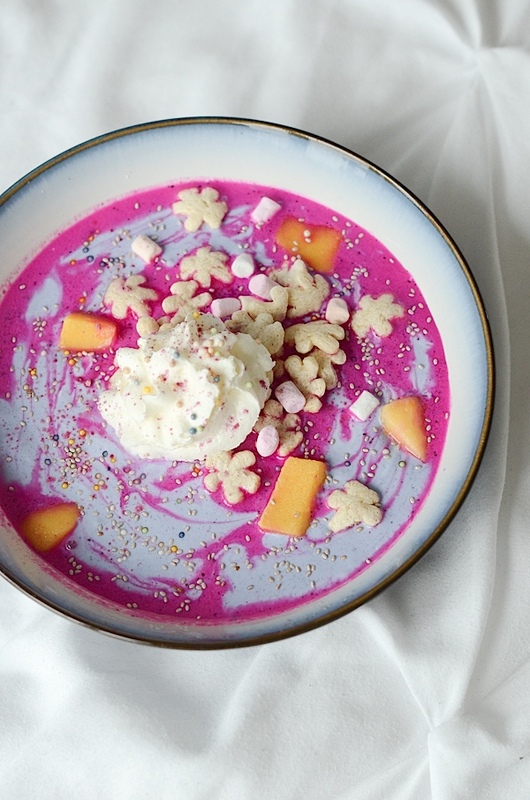 It’s basically a mango-lemon-dragon-fruit smoothie bowl. 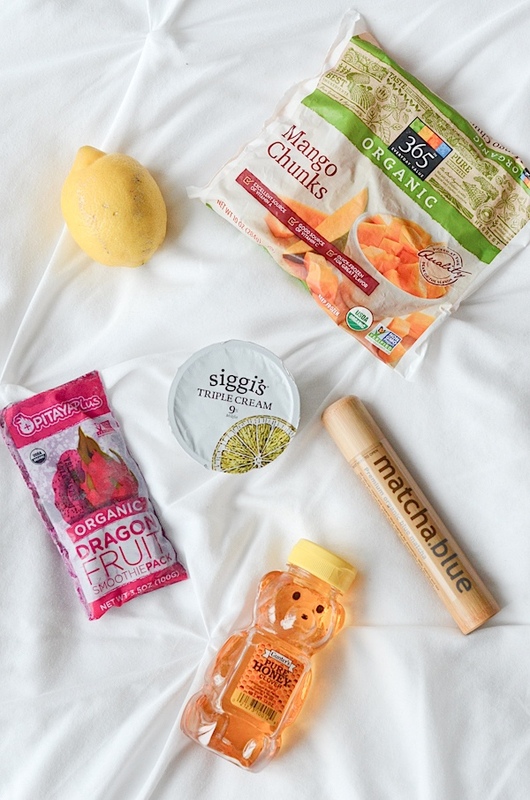 These ingredients were selected to play up the flavors of the Starbucks Unicorn Frappuccino. I was actually trying to make a healthy copycat recipe. Instead of mango syrup, I tried frozen mango. 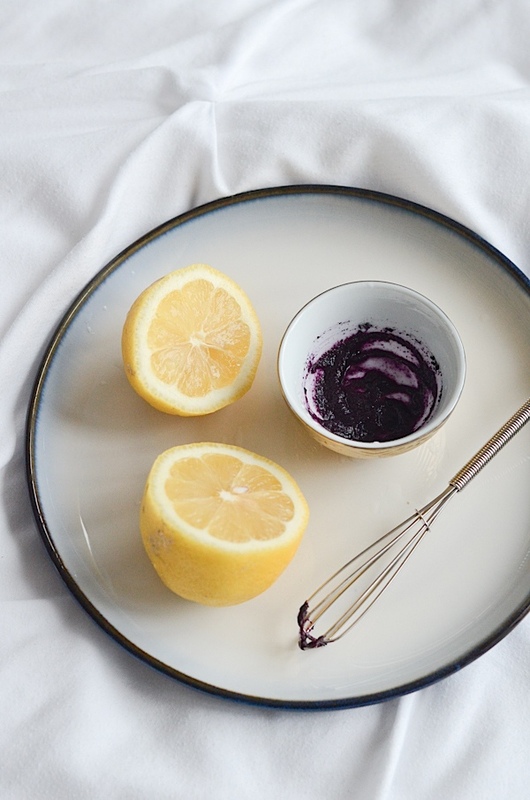 Instead of sour syrup, I tried lemon yogurt with extra lemon juice mixed in. But the texture and flavor were not what I’d hoped. So, I made lemonade out of lemons and turned this into a smoothie bowl. Woop! I still can’t get over how pretty the pitaya makes smoothies. You can get it in purée packets at the grocery store. I got mine at Whole Foods. The brand I found is called Pitaya Plus. Literally, the only ingredient is pitaya. And it’s so hot pink naturally! Well, dragon fruit comes in different colors. So, if you purchase a dragon fruit at the grocery store, don’t be surprised to see white or yellow inside. Anywho, these dragon fruit bowls are great for breakfast or as a snack. Check out this article by LifeHack.org about 10 Surprising Benefits of Dragon Fruit You Never Knew. To prepare the blue yogurt mixture, I recommend mixing the matcha into lemon juice before stirring into the yogurt. You can stir this straight into the yogurt container with some honey. I used a tiny whisk to get it evenly distributed. You can make this first and set it aside while you prepare the main portion of the recipe. Once you’ve blended the mang0-dragon-fruit mixture and poured it into a bowl, you can do the swirls. Pour the blue yogurt mixture into the bowl in three different areas and then use a tooth pick to swirl it around a bit. The best thing about smoothie bowls is being able to decorate them. At least to me. And at least when it comes to unicorn bowls. If you’ve been into the unicorn thing lately, you’ll know most toppings are pastel and rainbow all over. These colors are difficult to achieve with natural sources. I found a slightly more natural cereal with marshmallows at Whole Foods. This is the 365 Little Cubbies cereal, which gives you the colorful marshmallows. According to the ingredient list, the colors come from beetroot red and curcumin. You can add granola to the top of your smoothie bowl if you want something a little more nutritious. The Little Cubbies are a bit more for looks. But a little goes a long way. You only need a handful, which is about 1/4 cup. A handful of frozen mango adds a fun, orange pop to the top of this Unicorn Smoothie Bowl. White chia seeds almost resemble sprinkles, no? I love chia seeds in my smoothie bowls, so I definitely wanted to add some of these. They have so many great benefits. According to this article by Dr. Axe, chia seeds can boost your energy. The only reason to add this is for looks. And fun factor. 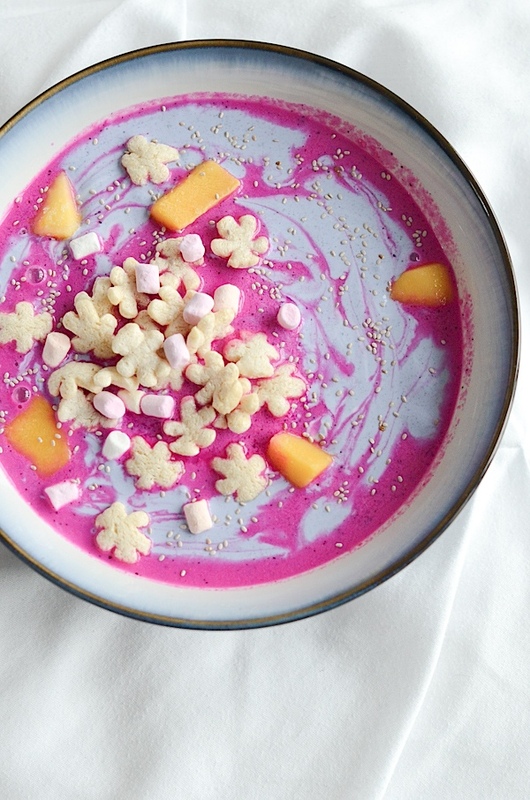 These “Sprinkelz” by Let’s Do Organic add a bit more color to the top of this smoothie bowl. According to the ingredient list, these colors are from vegan sources. A light dusting of pink matcha powder adds a wee bit more color too. The pink brings out the natural hot pink of the pitaya. If you only have blue, you can use that instead. And here’s the finished Healthy Unicorn Smoothie Bowl Recipe. Pretty and pretty nutritious. 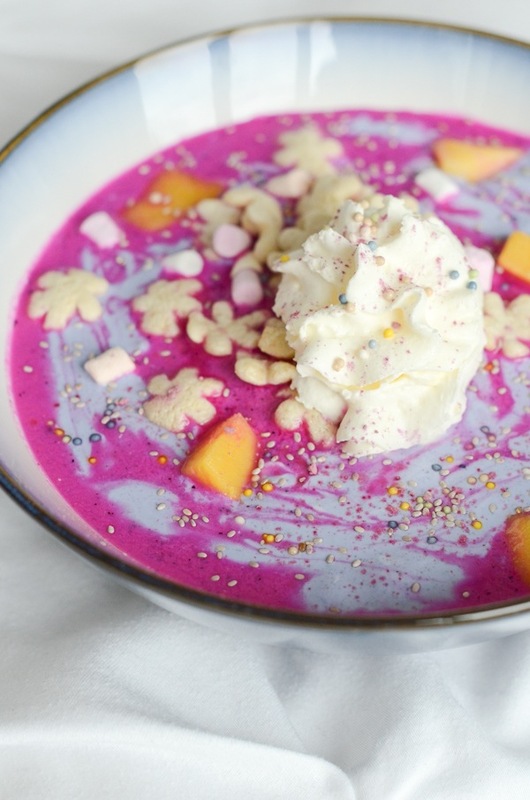 Make a dragon fruit bowl with magical looks with this Healthy Unicorn Smoothie Bowl Recipe. It’s made with plant-based colors and plenty of fruit! In a small bowl, whisk together blue matcha powder and lemon juice. Pour half of the yogurt into your blender container. Whisk the blue matcha mixture into the remaining yogurt in the yogurt cup until smooth. Set aside. In your blender container, add pitaya, mango, ice, almond milk, honey, and vanilla extract. Blend until smooth, adding additional almond milk if needed to get the mixture to blend (about 2-3 minutes). Taste test and add additional honey, if needed. Pour into a bowl. Pour yogurt mixture into the bowl in 3 different places. Use a toothpick to swirl. I have more unicorn recipes on the way. Well, at least one. Check back for more. 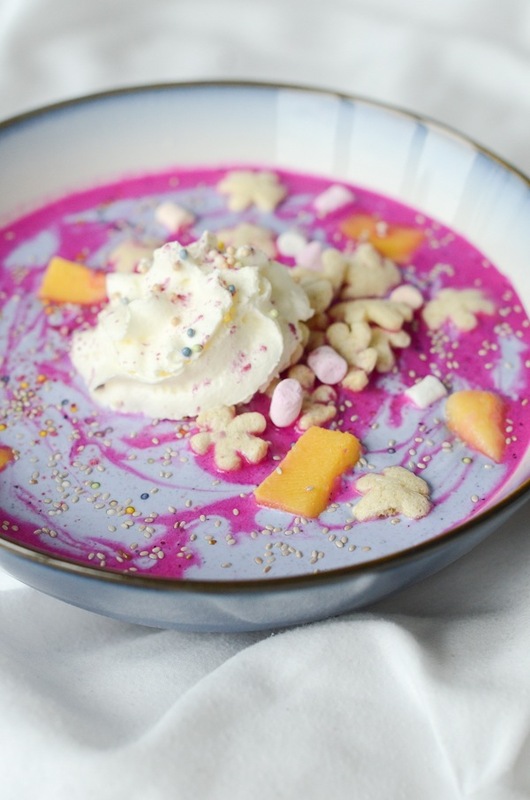 Hope you enjoy this Healthy Unicorn Smoothie Bowl Recipe. Thanks for reading!